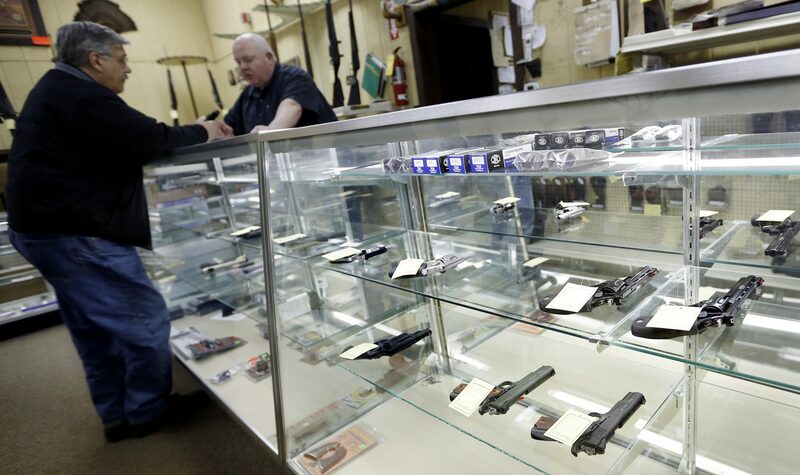 FILE PHOTO: Gun World salesman Alfred Ozga, right, talks with a customer at the sparse display of handguns available at the store. (Harrisburg) — After a year-long review of firearm safety in the commonwealth, Pennsylvania’s Auditor General has released a report with 12 recommendations for reducing gun deaths. Auditor General Eugene DePasquale said he focused on how existing law can have a positive impact on safety and the public cost of providing care for those who are shot. The report was assembled with input from gun safety advocates, health care professionals, law enforcement, and gun rights groups. DePasquale noted mass shootings like the one at a Pittsburgh synagogue last month attract the most attention, but they account for less than one percent of all Pennsylvania firearm deaths. The majority are suicides. The report recommends measures to reduce the stigma attached to mental health issues and increase mental health treatment in hopes that would lessen the number of suicides. It also recommends investing in violence prevention and gun safety training programs and equipping law enforcement to keep guns away from potentially dangerous people. DePasquale said on top of the human toll — about 1,500 people die each year statewide — gun violence also has a heavy financial impact. “Over the last decade, firearm-related injuries cost Pennsylvania taxpayers about $1.5 billion in total healthcare costs,” DePasquale said. The report arrived at that figure because 76 percent of shooting victims were either uninsured or on public insurance. Those dollars come from state and federal funds. DePasquale said he wants to see an effort to track lost and stolen guns that could be used in crimes. “I am urging the governor to sign an executive order requiring the state police to issue a monthly report on firearms traced from crimes,” he said, noting a similar measure has recently been signed by New Jersey’s governor. In addition, the report recommends sheriffs’ offices more thoroughly vet applications for concealed carry permits. Though applicants are required to give references, the Auditor General’s office found they are rarely checked.